Carbon films are uniformly amorphous and highly transparent to electrons because carbon has a low atomic weight. Due to their strongly interconnected three-dimensional network structure, carbon films have remarkable mechanical stability, even when as thin as 1 - 2nm3. 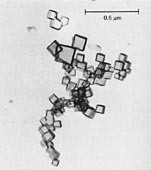 At thicknesses used in electron microscopy from about 2nm upwards carbon films are chemically inert, continuous and basically free from self-structure except for a speckled appearance visible at only the highest magnifications. Carbon depositions produce a film around the sides and back of specimens without specimen rotation (see EM picture to left). This may be explained by the deflection of light carbon atoms out of straight-line flight by collisions with gas molecules and with the walls or obstructions in a vacuum chamber. 1. Watt IM, 1985. The principles and practice of electron microscopy. Cambridge University Press, ISBN 0-521-25557-0. 2. Bradley DE, 1954. Evaporated carbon films for use in electron microscopy. Br J Appl Phys, 5, 65-66. 3. Hayat MA, 1981. Principles and techniques of electron microscopy, Vol 1 (2nd Ed), University Park Press. 4. Watt IM, November, 1991. Carbon - The electron microscopists most useful element. Microscopy and Analysis, pp 21-23. The carbon rods are offered in either spectroscopically pure or technical grades for standard electron microscopy evaporation requirements using carbon coaters. Due to the purification process used all carbon rods we supply have a graphite structure. The purification process removes impurities at a high temperature and causes the carbon to crystallize. The graphite structure has no adverse effects on the carbon coating or the carbon coating process. The user might perceive an additional advantage: the carbon rods (graphite rods) are less brittle than the carbon rods and are easier to handle and easier to shape. Technical grade carbon rods have a typical impurity level of around 50ppm or greater. Typical applications are non critical SEM or SEM/EDS coating of non-conducting samples. "Spec-Pure" (spectroscopically pure) grade is available for carbon (graphite) rods with impurities equal or less than 2ppm (single element 1 ppm or less). Typically the impurity level is more likely 1ppm or less. This grade should be used for TEM, FESEM, FIB, WDS, EBSD, Microprobe and more critical SEM/EDS applications. Spectroscopically pure graphite structure carbon rods with an impurity level of 2ppm or less with 1ppm as maximum level for each element. Trace elements can be Si,	Al,	Fe,	Mg,	Ca	or	B (less than or equal to 1ppm). 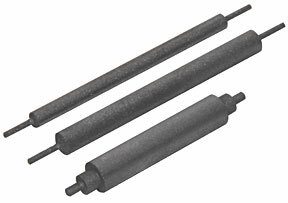 The rods are all 12" long with three nominal diameters (1/8", 3/16" and 1/4") to comply with the carbon source used in different high vacuum carbon evaporators. Highly recommended for TEM, FESEM, FIB, WDS, EBSD, Microprobe and more critical SEM/EDS applications. Density 1.10 g/cm³, resistivity 67 µΩm, hardness 32 shore, and porosity 29%. 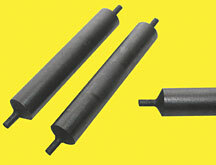 Frequency Specific High Purity Carbon Rods for Cressington Carbon Coaters. Impurity level of 5ppm or less. Technical grade graphite structure carbon rods contain impurities typically equal to or less than 50ppm. However, as an exception some batches can contain impurities up to 200 ppm. The impurities typically consist of: (ppm max. ): Ca 20, Fe 20, Cr 10, Si 2-5, Ti 8-10, V 4-4 and traces of other elements. Use this grade for non-critical SEM and SEM/EDS applications. All pointed carbon (graphite) rods are made from spectroscopically pure (impurities <2ppm, no element more than 1ppm) graphitized carbon. Trace elements can be Si,	Al,	Fe,	Mg,	Ca	or	B (less than or equal to 1ppm). 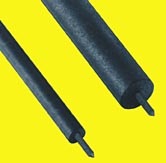 Pointed carbon rods give improved evaporation procedures and enable consistent carbon coating. Tip: 3.8 / 1.6mm (.15 / .066") double neck for Cressington carbon coaters. Impurity level of 5ppm or less. 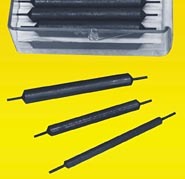 For re-sharpening graphite tips use the PELCO easiShaper™ #58 or the Two Step, Hand Carbon Rod Shaper #57-10, see below. 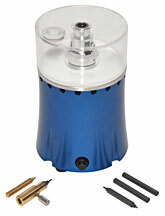 The PELCO easiShaper™ is an electric motor driven carbon rod sharpener which offers easy, quick and clean carbon rod shaping for carbon evaporators which are using either 1/4", 1/8" or 3/16" stepped carbon or graphite rods. The easiShaper™ produces more consistent, smooth and uniform carbon tips than any hand shaper. It is designed for cutting single and double stepped carbon rods (used in the Cressington carbon coaters). The cutting head incorporates two tungsten carbide cutting blades, a top guiding bearing and vortex design to keep the carbon dust in the dust collector. A blade setting gauge is included to reliably set the cutting blades for a single step of 1mm (0.039") or double steps with 1.65mm (0.065") and 3.8mm (0.15"). The PELCO easiShaper™ carbon rod shaper is ideally suited for busy, multiple user labs, high throughput microprobe labs and presents a clean alternative to hand rod shapers. The PELCO easiShaper™ carbon rod shaper includes a carbon rod holder for the common ¼" carbon rods. Additional holders for 1/8" and 3/16" carbon rods are available as an option. 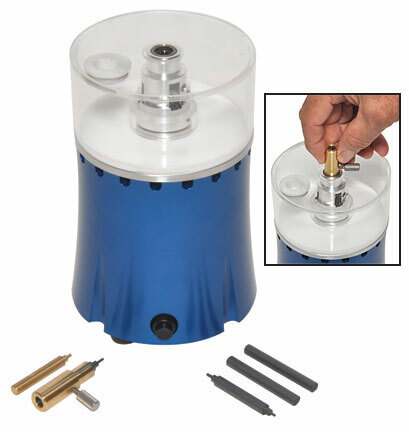 The carbon rod holder holds the carbon rod and is inserted in the top guiding bearing to produce precision cut tips. The integrated carbon dust collector is easily removed for cleaning and/or blade adjustment. The vertical design of the unit makes operation easy and saves valuable space. Universal power supply for 100-240V and 50/60Hz. UL listed and CE certified. Hand tool for shaping / sharpening two step carbon rods for the Cressingtion Carbon Coaters. Graphite rod is inserted into tool and rotated by hand against two pre-set tungsten carbide cutters to achieve the correct steps. Comes with brass adjustment tool. 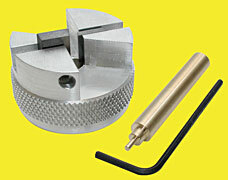 Simple hand tool for sharpening Carbon rods into 1 millimeter cylindrical tips. 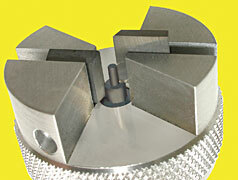 Rod is inserted into tool and rotated by hand against an adjustable tungsten carbide cutter to the desired length. Possible carbon pointed rod shapes and their setups. The right illustration, with neck rods, is usually preferred. 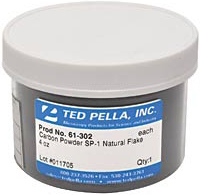 Fine carbon powder in graphite form. Very high purity with trace elements less than a total of 2 ppm. Trace elements can be Si, Al, Fe, Mg, Ca or B. Graphite flake size is 200 mesh (75% through 100 mesh). 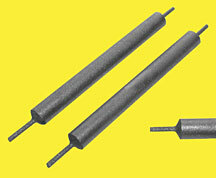 Can be used for pelletizing or mixing with resins or epoxy to make them conductive. Sold in 4 oz. (113g) container. These high purity carbon fiber threads or braids are used in carbon evaporators or carbon coating attachments, used on sputter coaters, designed for the use of carbon fiber. The thin carbon layer will act as a conductive layer on non-conductive samples to enable charge free imaging and EDS X-ray analysis. The carbon fiber braids, when attached properly to the holding posts, will give repeatable carbon coating thickness when the same distance from sample surface to evaporation source is used. The carbon fiber braids are processed to resist unraveling at the ends when cut to length. The special heat treatment also produces a spectrographically pure carbon fiber, with impurities only up to a maximum level of 5-10ppm which is not detectable by EDS systems. Saves the work of shaping carbon rods. The power requirement is approximately 20V/20A depending on diameter, but varies depending on the brand of coater. Please consult the instructions with the coater to determine which carbon fiber thread fits best. Purity of the carbon thread is 99.9% or better: small amount of calcium and silicon could be present. The carbon fiber threads are available in three thread diameters; 2.5, 1.3 and 0.8mm. The thicker thread with a diameter of 2.5mm and a density of 1.6g/m is widely used in general applications and gives a medium carbon layer thickness. This thicker thread is recommended for use on carbon coaters made by Quorum Technologies, SPI, Emitech, Polaron, Fisons and Technics. The medium thread with 1.3mm diameter and a density of 0.7g/m is recommended for the same carbon coaters as mentioned above, but for applications where a thinner carbon coating is required. The carbon coating thickness can be increased by using multiple threads. The thinner thread with a diameter of 0.8mm and a density of 0.4g/m is recommended for the thinnest carbon coatings. The thinner thread also exhibits better compatibility with carbon coaters made by Fullam, Leybold, Denton and Baltec.